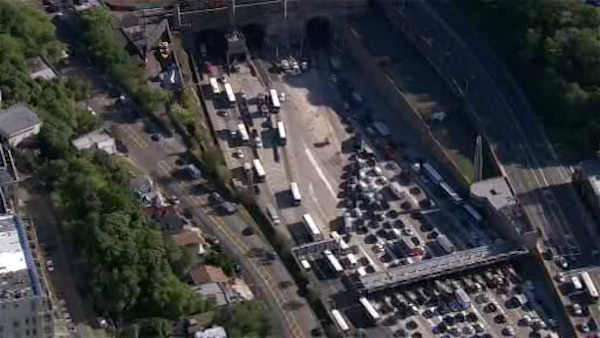 NEW YORK (WABC) -- An accident involving two buses in the Lincoln Tunnel Monday morning caused major backups heading into Manhattan and sent 20 people to the hospital with minor injuries. One NJ Transit bus bumped another inside the center tube in the left lane just after 7:30 a.m. The 114 line bus, from Plainfield to the Port Authority Bus Terminal, rear-ended the 190 line, from Paterson. The 190 line bus was carrying 57 passengers. The 114 line bus was carrying 46 passengers. In addition to those hospitalized, 28 other people on the buses were evaluated with no injuries.